Crookneck retreat is located at the base of Mt Coonowrin(Crookneck) one of the National Heritage listed Glasshouse Mts. It also backs onto a national park, giving the property the diversity of native fauna and flora while nestled amongst 10 acre orchard farm. Including Macadamia, Pecan, Mangoes and Native bush fruit. 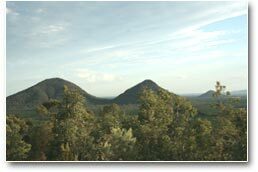 The spectacular views and the mystical legends of Glasshouse Mountains make it a must see destination. Glasshouse brings you back to nature giving you a tranquil laidback setting less than one hour drive north of Brisbane. Glasshouse is central to both the golden beaches of Sunshine Coast and the many quaint historical towns of the hinterland. Your luxury cabin offers all the modern conveniences whilst experiencing wondrous bushland and panoramic views of Crookneck. Enjoy kicking back on the deck or relaxing in your Spa, contemplating the mystical legend of Glasshouse Mountains. Wake up with the sounds of the bush, the songs of the birds and the peace and quite of country living. Wander through the tropical and native fruit trees and try the different fruits or maybe pick-up a macadamia or two. There is much to do, or nothing to do the choice is your when you come to Crookneck retreat. Crookneck Retreat is proud to announce the opening of a brand new cabin on the property, encompassing everything our guests have come to know and love about the accommodation offered at Crookneck. Exit left at the Glasshouse township, follow the road over the railway and turn left onto Coonowrin rd. At the end of Coonowrin rd turn right onto Old Gympie rd and follow approx for 2km until you reach CrookNeck Retreat.